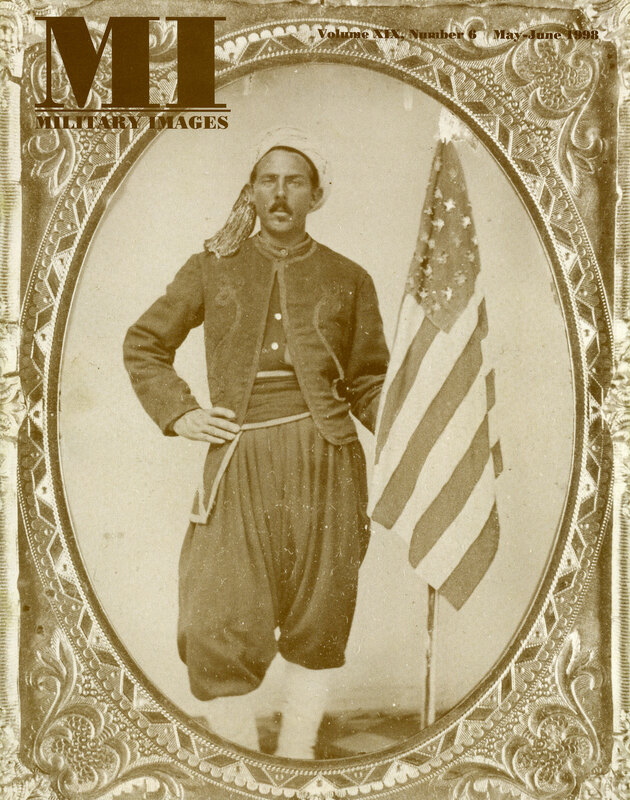 A quarter-plate ambrotype of a soldier from the 5th New York Infantry, also known as Duryee’s Zouaves, is from the Helder Costa Collection. The editor laments the passing of long time contributor Wendell Lang. Letters include corrections to stories in the previous issue about the Frolic, “Hope of the 22nd Ohio,” and an image misidentified as Joshua Lawrence Chamberlain. In this ongoing column about technical aspects of photography and collecting, the characteristics of the ambrotype are highlighted. The books Images of the Spanish-American War, April-August 1898 (Pictorial Histories) by Stan Cohen and Mathew Brady and the Image of History (Smithsonian Institution) by Mary Panzer are reviewed. A history of Capt. Joseph Haddock Dorst’s Gussie Expedition and the first American landing in Cuba is detailed here. The narrative is illustrated with images of Durst and the Gussie. Newspaper advertisements for Bailey’s gallery appeared in editions of the Plaquemine, La., Gazette and Sentinel between February and July 1861. Only one portrait credited to him is known to have survived, and it is an ambrotype of a Confederate officer tentatively identified as 2nd Lt. Joseph Warro of the 11th Louisiana Infantry. The photograph is reproduced here. This collection of Southern military men includes Simon Turman of the 7th Florida Infantry, Robert A. Duncan of the 13th Arkansas Infantry, Mitchell Putnam of the 1st Texian Volunteers, Cornelius Patrick of the 5th North Carolina Cavalry and his wife Mary Agnes Sullivan Patrick, Pvt. Elihu H. Griffin f the 5th Alabama Battalion and seven unidentified soldiers. Six of seven LeRoy boy served as privates in the “Oconee Rifles,” which became Company E of the 1st South Carolina Rifles, also known as Orr’s Rifles. All of them died. Portraits of five of them illustrate the text: David, Samuel P., Charles T., John and Hiram Andrew. This survey of Zouaves totals 17, and it includes a squad of men from Company C of the 34th Indiana Infantry, an original Zouave in the French army, a member of the 5th New York Infantry, a soldier in the 11th Indiana Infantry, a Papal Guard Zouave and more. Five portraits are all unidentified soldiers. Sgt. James E. Taylor of the 10th New York Infantry, also known as the National Zouaves, and Pvt. Richard Louis Spalding Taylor of the 6th New York Infantry, or the Billy Wilson Zouaves, and later the U.S. navy, are profiled here. Portraits of both brothers are included are, along with illustrations of Civil War scenes created for the regimental history of the 10th by James. In “Brave Lancers: Sixth Regiment Pennsylvania Volunteer cavalry (Rush’s Lancers), 1861-1865,” McAfee examines the distinctive uniform and record of this Keystone State regiment. The column is illustrated with a portrait of a Col. Richard Rush and an outdoor view of soldiers from the regiment in camp. In this installment, the sly captain tries to sell readers an original portrait of Bobby Lee. But let the buyer beware! Looks can be deceiving, as is certainly the case here. A dozen solo photos from the collections of our readers include three portraits of individual with canine friends, Union soldiers and a group of men, perhaps Southern soldiers or a hunting party, posed with a wagon drawn by a pair of white horses. An ambrotype from the Greg Starbuck Collection pictures an unknown militiaman or early war volunteer with the letters BRG on his shako. He may have been a member of the Bedford Rifle Grays, a company of the 14th Virginia Infantry.